"I discovered I was the creator of the hoover sound by accident"
Eric Persing was previously chief sound designer at Roland. While NAMM 2015 saw plenty of analogue synth arrivals, it was relatively light on new software news. One particularly notable launch, though, was Omnisphere 2, the second incarnation of Spectrasonics' flagship synth instrument. 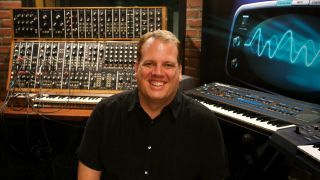 In an exclusive interview, we caught up with its creator - Spectrasonics founder Eric Persing - to find out more. There are a huge number of new additions to Omnisphere 2, and we're impressed with the audio import and 25 new effects (particularly the new 'Innerspace 'effect). Tell us a little more about them. "The creative part is being able to load your own audio in, and use it as a waveform - and then the granular stuff you can do in Omnisphere, and the effects, and the waveshaping… to turn your audio into new sounds that are completely your own. I think that will help people understand that Omnisphere really is a creative tool, not just a library of sounds. "The technology behind Omnisphere 2's new 'Innerspace' effect has been around for a long time. It's like a sound designer's secret. We've used this for many years - I was using it for [sample library] Distorted Reality 1. Instead of using a convolution effect for reverb, you put other kinds of recordings into it, and then the convolution effect takes those characteristics. [making custom impulse responses] is something you can do yourself - but there are a lot of tricks for how to make those custom impulse responses so you get interesting musical results, because if you're not careful, a lot of times, the kind of things you put in will blow up the frequency response, giving crazy peaks, so we do a lot of massaging of the impulses behind the scenes. "I could do a demo just on the analogue effects we've added, because they're all circuit-modelled, and beautiful. We've got beautiful ARP string ensemble chorus - put a straight sawtooth wave through that and it sounds incredibly close to all those famous string machines. Each effect is like that, so it's a hard product to demo - I've not demoed any of that, because if I was to focus on that, it would just be a demo about the effects, and not about the synthesis and all the sounds. With the new Sound Match and 'creative browsing' features, it's clear you're helping the Omnisphere user find sounds more intuitively and efficiently. Tell us a little more - how exactly are the sounds in the library categorised and tagged? "We want to encourage people to use it as a tool, because you don't have to use all the factory sounds. Someone might say, 'That's not the way I work. I prefer to start with a clean slate, and create something on my own and turn it into my own thing'. That's how I feel too! So, if you want to use your own sounds, and you don't like the idea of all these factory presets, you can have Omnisphere start up and it won't see the factory sounds, only your own sounds. You've always been able to do this in Omnisphere, in fact! "Well, we have it on Netflix and Amazon - it's practically how the internet works - but this is the first synthesizer to have it. It analyses a whole bunch of factors about the sound - how the sound was created, what kinds of sound sources were used… so now you can find sounds by mood. This categorisation takes us years of full-time staff debating over each sound… "Is this 'nightmarish', or is it more 'dreamlike', or both?". It's entirely subjective, and yet not. If subjective had no meaning, then all art would be pointless, right?! We relate to things because of subjective choices made by a director or an artist, so there are universal things, which is why there are scary movies - subjectively scary, but still scary movies! "It became obvious that we only need categories that you'd describe when looking for a sound - for example, 'I want a texture, pluck, percussive or bowed sound'. It's pretty difficult to organise electronic sounds - how do you categorise abstract sounds? Electronic sounds? Textures? What kind of language do you use to communicate to another person in a way that makes sense? For example, Omnisphere has this gigantic collection of textures. Some should be played with one finger or two-finger chords. Others are less harmonically-complex, so when you play chords, it works really well. "These were mixed up in the same category, so we made two - one is 'Textures - Playable', and the other is 'Textures - Soundscapes'. So just a little change like that makes a huge difference, as you know that some are ones you play, and others are ones you trigger. When you put these small changes together, finding the sounds you want is much, much faster and much easier - combined with the new fast loading of presets. "We have 'disturbing', which is different to 'nervous'... so the tagging and organisation is a lot more rich… and it's also looking at the names of the sounds, parts of the names… so it's looking at a lot of different things, and it shows you how many matches. "The intelligence part of it is: 'Which of these factors is more important to match?' So that's what's going on behind the scenes, and it works great. Even if it finds something that's not exactly what you want - just like how Netflix recommends a movie that's nothing like your current movie - it doesn't bother you, as one of the other choices might be interesting. So the Sound Match thing really helps. "Another thing I didn't talk much about during the [NAMM 2015] demo, which is neat when you're collaborating with people, is the new Easy Sharing feature. This is especially important once you begin to create your own patches and import your own audio. "Adding audio is extremely easy - you just drag and drop .wav or .aiff files into Omnisphere 2 and they show up - but you can do so many things to the sound, and you start creating all these patches and creations. If I want to write with someone else, and I want to send them the files I've created at my end, made using audio from somebody else, I don't know what sound sources and patches to send to make sure it loads on their system, so you then have to hunt all this stuff down. "We've simplified all that, so you just select the patches you want to send somebody, and you say 'Share Sounds', and it packs them up into a little .omnisphere file, and you send that to the other person, and they say 'Add Sounds', and it puts all the right sounds in the right places, making it easy to collaborate with other Omnisphere 2 users. "There are already a lot of Facebook groups and online communities who share the Omnisphere  sounds they use, so we can see that increasing a lot. Not only can users share their patches, but all the sound sources used, and all the custom stuff that people have added to them. It's a neat thing for collaboration, and also for third-party sound developers too, enabling them to deliver their libraries much easier. We're just scratching the surface of what the engine can do now, and we'll continue to add patches as time goes on and we discover more of the things it can do. How did you get started? Tell us about the Spectrasonics background and history. "We've just celebrated our 20th anniversary, so this is now our 21st year. At the NAMM Show in '95, we first introduced Distorted Reality. "Before Spectrasonics, I was chief sound designer for Roland, so I did all of Roland's synths and did all the sound design, and made the 'hoover' sound. So I had a great experience with Roland: I got to make all the sounds for the Jupiters, the D-50, the V-Synth, all the sample libraries. I was going all over the world and sampling everything for Roland. I was in charge of all the sound design, and we started making the CD-ROMs that Roland would sell for the Roland sampler. It was very frustrating because Roland didn't really understand that the sounds themselves were amazing products - we had spent a lot of time and money to create some amazing samples, but Roland are a hardware company, and didn't really understand that the sounds themselves could be a product. They'd sell the CD-ROMs (that we'd spent four or five years and millions of dollars making), and they'd put them with the Boss socks and the shoelaces at the back of the catalogue. "I realised that, when the whole sample CD stuff started, that this is a lot more interesting to me. The sounds themselves and the software - not so much about hardware, more about the sounds. So I had an idea for our first product, Bass Legends. "I was frustrated as I had a good idea but I didn't think Roland would be the right company to do it with, so my wife said "Why don't we just do it ourselves? We can probably sell a couple hundred copies, and make enough to buy a new Honda or something"... so that was the business plan! "Everything else happened after that, becoming a software company and having the first virtual instruments. It's been amazing to see the whole thing come about from the beginning up to this point. I can have an idea and can see that idea all the way to a product. "Omnisphere is the first synth that I'm completely in charge of. I loved all the things I got to do with Roland, and my ideas made it into the synths, but they were their synths. "We started with Atmosphere, Trilogy and Stylus, and we worked with UVI (and helped develop their UVI Engine) to create some of the first virtual instruments. We realised that, to really take it where we want to go, we needed to be our own software company. We got our own software team, did our own coding, and built our own thing. "I was really wanting to do something that I did completely myself, and it's nice with Omnisphere 2, that people can see where we're going. We're not going to release 50 different synthesizers, each slightly different. Our philosophy is: we're really good at making something big and epic. Once you have those foundations, we don't need to reinvent the wheel. We don't need new envelopes; we have great envelopes! We can add more filters, expand what the oscillator can do, increase the granular, FM, and there's much farther we can go in the future. This is exciting to finally be able to show people: this is where we're headed, we've got a great synth and it's going to keep getting better and better - increasing what users can do with it." "That's what we do well: very big, epic things that appeal to a lot of different people on different levels." So you created the original 'hoover' sound? "What happened was, I discovered I was the creator by accident. We [Roland] were getting a lot of feedback from Europe and the UK, that they wanted more dance/club-oriented sounds. There was this important sound - this 'hoover' sound' - that Roland synths had to come with now. We were like "Hoover sound? What's that?" So I had to research the sound. It was the early days of the internet, and I found some bulletin board somewhere - someone explained what this 'hoover' thing was. "An Alpha Juno? I did the Alpha Juno! That's my patch!" So I was researching how to make the sound, but I was the originator of the sound! "The story of that patch was, I put that in as a joke, as the Japanese love sounds like cows, cats, birds - they love that kind of stuff, so I made this kind of funny 'rroooow' sound, and I just said "What the…", and saved it really late in the bank, after the more important sounds like the synth brass and fake Rhodes. They liked it, but that was all I thought of it. To find out that it was this huge sound, and all these genres came out of it… out of all the sounds I've created and have been used in so many different things, all the D-50 stuff, it'll probably be the 'hoover' that's the biggest one, and it was a total accident. It's hilarious!" What was your biggest challenge in the creation of Omnisphere 2? "I wouldn't say that Omnisphere 2 was particularly challenging, especially compared to Omnisphere 1. Building our own engine from the ground up is a lot of work. Once you have the engine, and it's really solid and working, the hardest part is done. "This part has actually been pretty fun. We worked from the bullet points on our site, and asked 'What would we like to do? What things can we do right now? What can wait until later?' It's a bit like cooking. The main challenge is time - all good things take time. "Actually, the hardest part was realising who we are. For example, we were going to add six new waveforms - to more than double than Omnisphere 1's four. We suddenly realised that we can make each complete wavetables, and the developers gave us tools to create with the wavetables, and now we can analyse all the current synths, and put some Prophet 12 stuff in there… Things grew and grew, and suddenly we're a hundred times the scale. "So that's who we are. We do everything epic and huge, and probably won't ever make anything small and simple. We're good at making a product with an awful lot of ideas in it. It's the combination of those ideas that creates something that's greater than the sum of its parts." Where do you see the future of software and technology going? "There's a lot of potential. We're at kind of a plateau right now, as there's been such an emphasis in the last five to seven years on mobile technology, but we're going to see [real computer advancements] again, and when they come, there are many things we'd like to do that we can't because of CPU requirements. "Now it's hilarious - 3GB is practically just an email attachment! It's the same thing now - Omnisphere is close to 64GB, which is a hefty size right now. "That's why we're always pushing what the computer can do, as in a little bit of time, it'll be no big deal. For us, sound quality is everything, so if getting it efficient changes the sound, we'd rather have it take a little more CPU, as pretty soon it's not going to be a big deal. For software, that's going to be a big thing, as you're going to be able to see some technologies that haven't really matured in terms of products and useable things. There's a long way it can go, and it's an exciting thing. "There are some challenges with technology - how much can they fit in the size of an atom and the amount of molecules they can fit on a silicon chip, they're running into limitations, but there will be a breakthrough. We're not quite there yet, but when it happens, you're going to see a whole wave of amazing new things with sound - although that'll probably be the least of our worries, as that'll be when we have all this stuff embedded in our bodies! Virtual instruments will be plugged directly into our brains!" "We're super excited to have a lot of things in the works. We've got things in the works for Trilian, and also RMX - we haven't forgotten about rhythm! - so there's a long future for all the things we do. And there'll be new instruments, too - not just the three we've done, but new ones."